Leave the highway at exit 8 and follow the N 31 direction Zeebrugge. After passing through small tunnels, leave N31 at exit JABBEKE , turning right. Now you are in the WITTE BEERSTRAAT, and we live in number 31. Exit the railway-station trough the back entrance, this is besite platform 10 and turn right. Pass the tunnel for bikes and foot-passengers that runs parallel with the railway. Keep following the railway until you reach the traffic lights at a square. Cross the square and follow the GISTELSESTEENWEG. The first street at your right, with a pharmacy at the corner, is the WITTE BEERSTRAAT. We live in number 31. You also can take bus 5 or 15 which are in front of the railway-station. 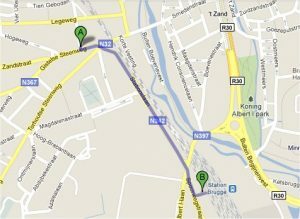 The stop “Phare”, the second stop, is very close to the WITTE BEERSTRAAT, where we live in number 31. A taxi, also leaving in front of the railway-station cost about 10 €.